Last night I decided to sift through some old photographs to bring something new to the blog today. (Make sense?!) Dizzy with delight when I landed upon this snap oozing with color and edgy fun. 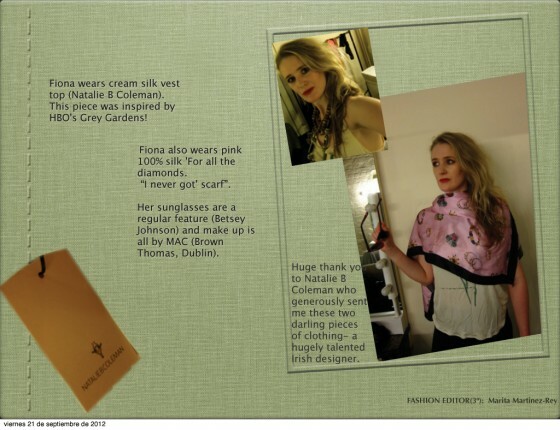 The very talented, Natalie Coleman, was so kind as to lend me a beautiful pink, hand-illustrated watercolor silk scarf. The delicate cream vest top as inspired by the HBO production of ‘Grey Gardens’.
! I hope you like the T shirt it is a quote from Grey Gardens which I fell in love with! I have been so lucky as to keep the vest top which I often pair with a black blazer and jeans for a sophisticated look. For a more relaxed feel I simply wear with a long trench coat and baggy trousers, certainly more of a snug Autumnal-type evening.